A new lifeboat for Sennen Cove in Cornwall could be paid for by collectors of rare Faberge Eggs. Fifty of the glamorous eggs will be sold at auction in London for a minimum of £10,000 each. Some of the proceeds from the sale are being given to the Royal National Lifeboat Institution (RNLI). The charity is trying to raise £1m for a new Tamar Class all-weather lifeboat which will replace the existing Tyne Class vessel at Sennen Cove. Faberge have agreed to auction 50 of the limited edition eggs, made to commemorate the 200th anniversary of the Battle of Trafalgar. 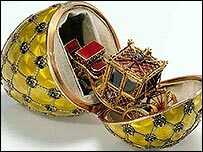 The eggs were the creation of Carl Faberge, a world-famous goldsmith who was jeweller to the Tsars of Russia. All the eggs will be sold with a reserve price of £10,000 - and at least £5,000 from each sale will go to the RNLI. 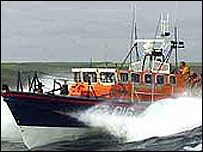 The RNLI fundraising will be launched on Monday in London.